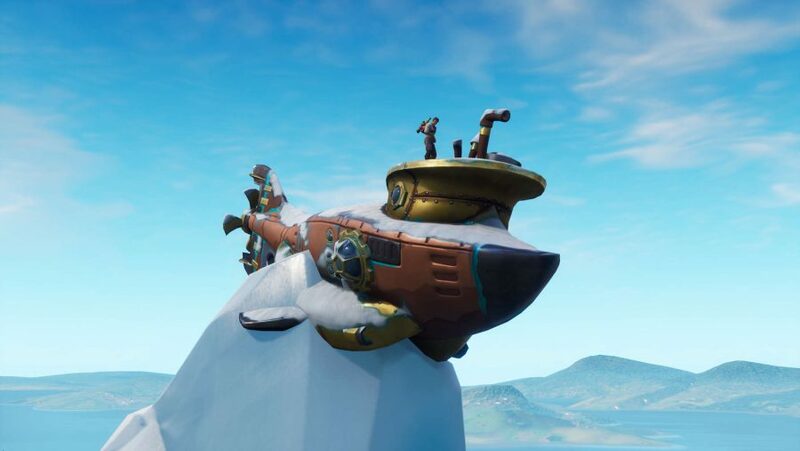 Where is the submarine in Fortnite? Fortnite season 7 is officially here and we’re having a great time as we dig our way through all the exquisite new features Epic Games’ have made and brought to the biggest and best battle royale game you can possibly play. But while the all the new cool stuff is exciting, challenge veterans like you will be keen to get started with their Fortnite challenges. So we’re here to help you find the Fortnite submarine location to dance on. As with season 6, there are three free challenges each week, but your dance on top of a submarine is of the four Battle Pass ones. Bear in mind, however, you will need to spend 950 Fortnite V-Bucks to get in on Epic’s premium progression system. That’ll get you 100 tiers of Battle Pass excitement with even more cosmetics such as the brand new Fortnite weapon skins. When it comes to everything Fortnite season 7, make sure you check out the Fortnite patch notes 7.0 that details all the latest stuff that’s just landed in the game. 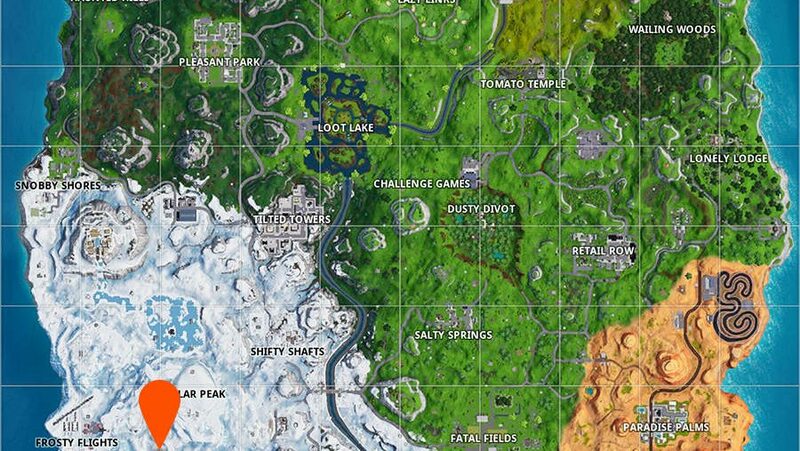 The outstanding new additions are the Fortnite season 7 map changes – including the new ice biome – plus some fun Fortnite planes to fly over the map. Anyway, enough with all that, here’s where the Fortnite submarine is located. This is part three of the staged Battle Pass challenge for season 7 week 1, so make sure you’ve completed the first two parts before you make your way over to dance on top of a submarine in Fortnite – you’ll need to bust some shapes amid a crown of RVs and a metal turtle, first. Now that’s out of the way, you can see a screenshot and a map (click to enlarge) showing the Fortnite submarine location above. 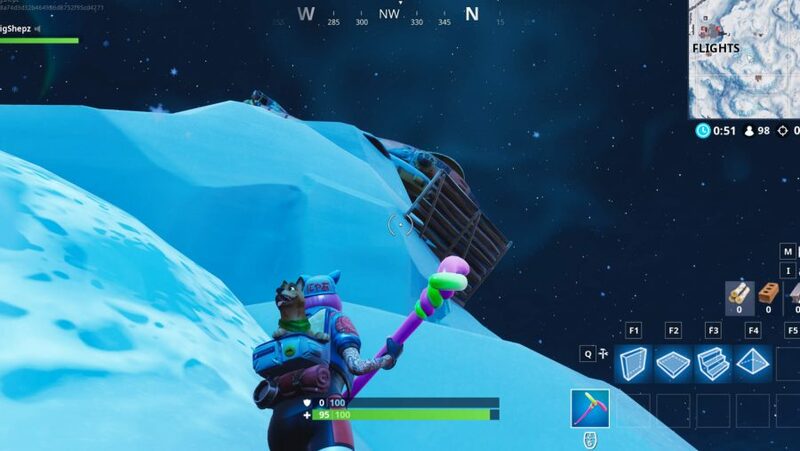 It’s on top of a mountain peak to the east of the new area of Frosty Flights near the centre of the new iceberg biome – you can’t miss it. Beware the slipperiness of the mountain, however, if you don’t land on it straight away, it can be tough to get back to the top without drawing attention to yourself. And there you have it, that’s where to dance on top of a submarine in Fortnite. 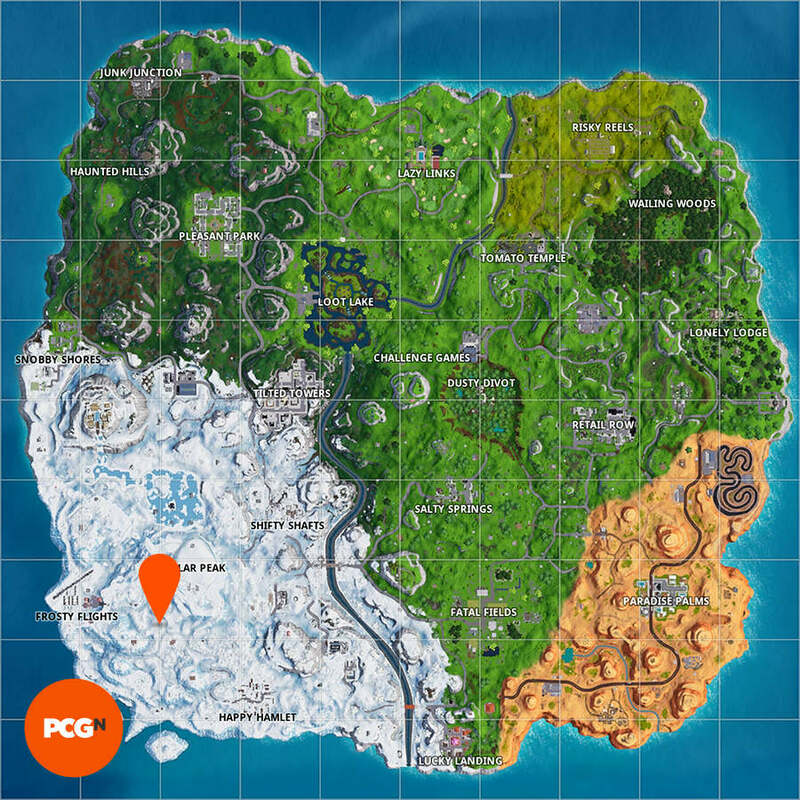 But the fun doesn’t end there: you also have to dance near Fortnite forbidden locations and uncover a secret Battle Pass tier from the Fortnite Snowfall week 1 challenge. We hope you have fun with the rest of your first batch of challenges and we wish you a happy Fortnite season 7.